For this acorns I bought some Kisses chocolate, a bag of semi-sweet chocolate chips, Nilla cookies (in mini size) and some Betty Crocker Rich and Creamy Milk Chocolate to glue the parts together. This past weekend I celebrated my youngest child first birthday. I’ve always been of the thinking that the first birthday should be different and unique. 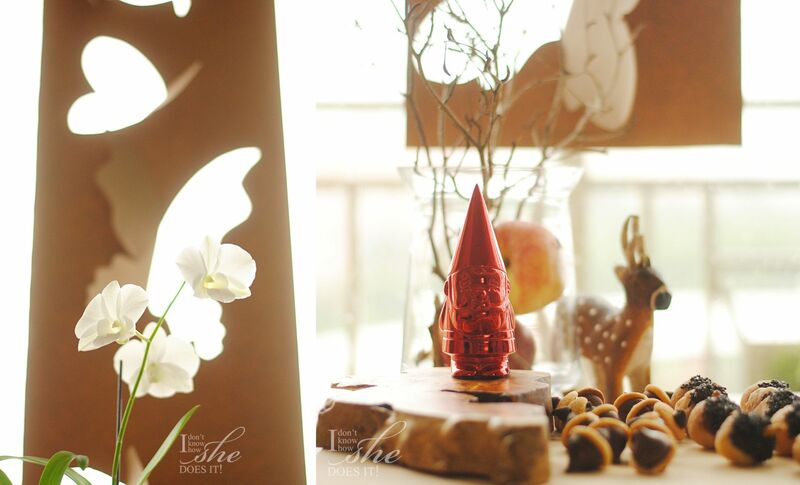 So after searching far and wide, I decided to make this celebration with the gnome and woodland theme. 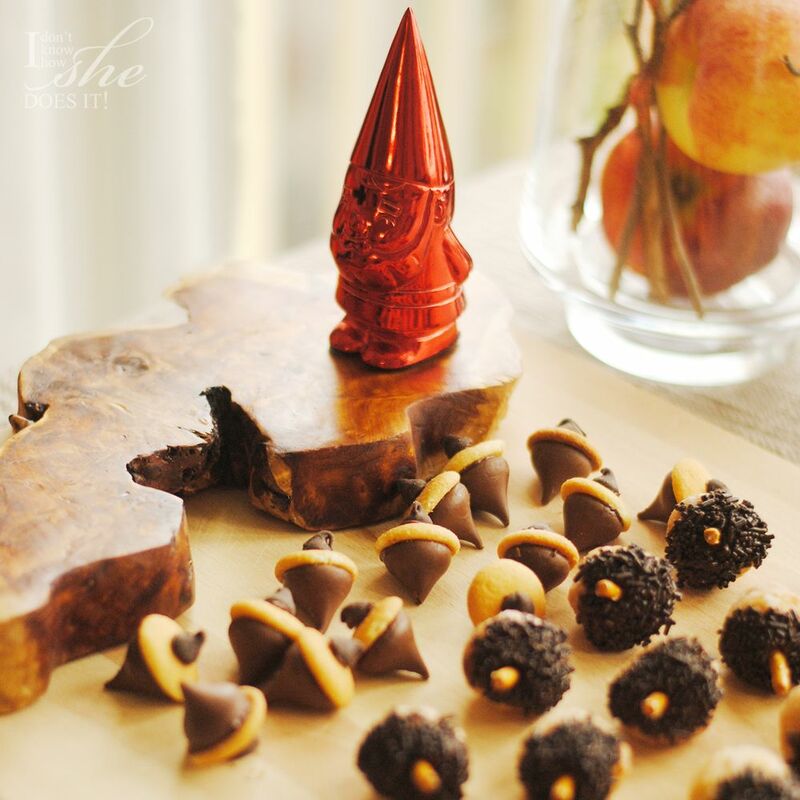 Pinterest was a great place to get some ideas and as you’ll see from my acorns, I visited some great websites to get some of my snacks in in order. 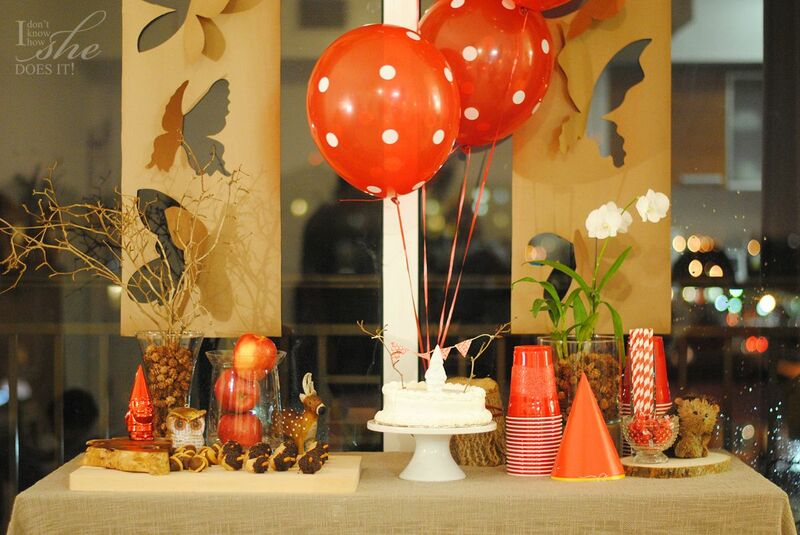 Pops of red made a huge difference in this woodland themed birthday. I already owned some of the items I used for this decoration: the clear vases, the wood pieces, cake stand, flowers and dried branches. One of the vases I placed some red apples to add color to the table. On the vase where I placed the dried branches (left side) I used some mini pine-cones to hold them in the center. I had a clear vase with a neutral gray color based (on the right side) which I used for placing a real orchid for and some more mini pine-cones. As you’ll see I try varying the heights of the elements I placed and also the used of red as the main color to revive the browns arounds. 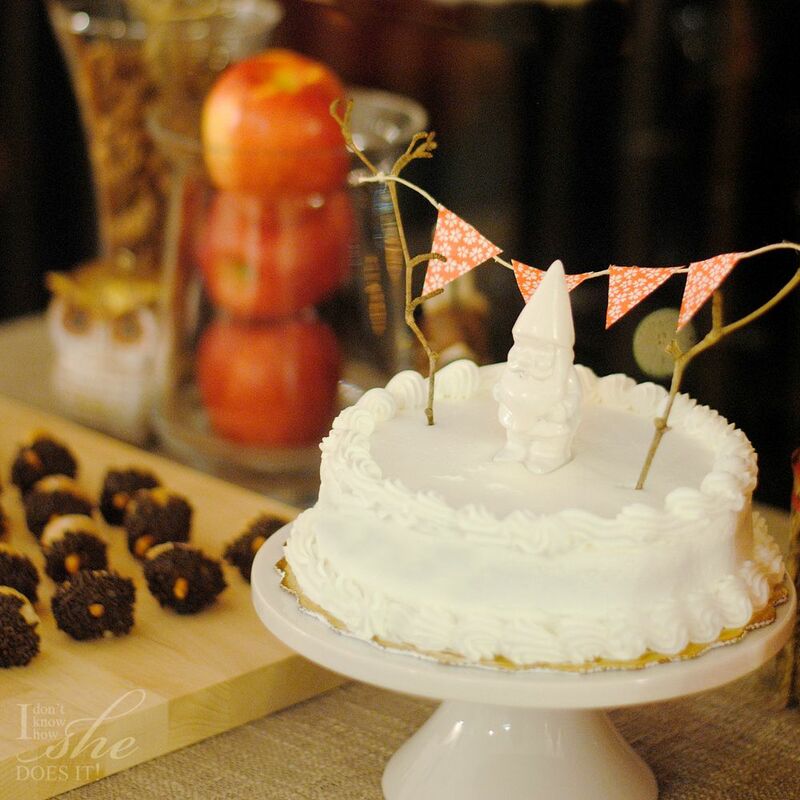 The center piece of this table was the girl’s cake which I let in white so it could stand out. I adorned it with another gnome (in white also so I could appear to pop out of the cake) and a bunting I did with some scrapbook paper and dried branches. To eliminate the emptiness or blackness of the background, I cut two banners (the exact size) from brown paper and drew halved butterflies. Then I cut this drawings with an X-acto resulting in a 3D butterfly image. You’ll notice I did them in different sizes and forms on both this photos and the second one. 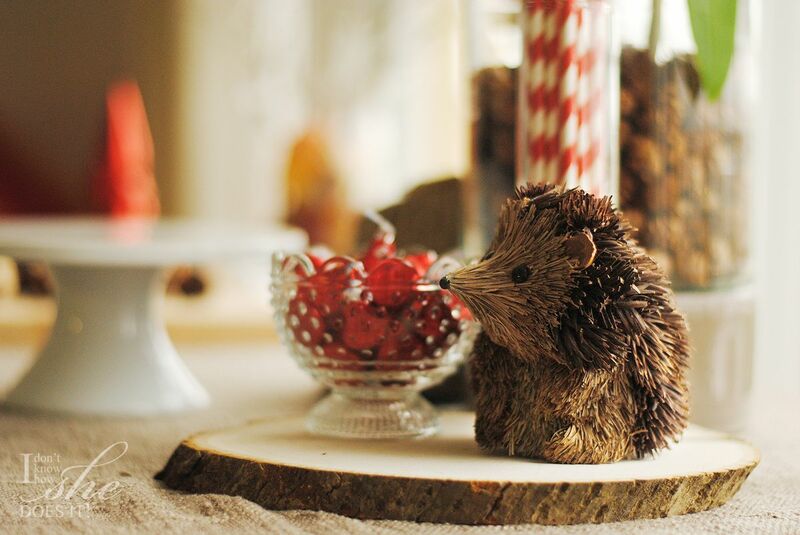 The red acorn vigilant gnome (from Target), cardboard deer (from HomeGoods) and hedgehog (also from Target) were the small details that I considered made this table more appealing to young eyes. Also the pop of reds here and there (with the Kisses, straws, plates, balloons etc) made this even a happier setting for all the guests resulting at the end in a very happy celebration to be remember for years to come. Oh Sam, you don't know how happy it makes me to read you. Thank you so much for this lovely visit. I have to add that the little one (my little gnome!) was more than surprised and glad to be part of this woodland fantasy world. Have an awesome week!! !